Get a free quote now from Early Times for your new chimney liner. One of the most important parts of a chimney is the chimney liner. It’s the passageway through which smoke and/or gas travels to exit the chimney. When homes are first constructed, they usually have clay or ceramic chimney liners. As chimneys age, the chimney liner can deteriorate causing a very serious fire hazard. Early Times Home solutions installs either aluminum chimney liners for natural gas applications as well as stainless steel chimney liners, providing the homeowner with years of worry-free comfort for your family. Over time, the original liner can breakdown and no longer contain the products of combustion. The most common chimney liners are made from clay, aluminum or stainless steel. We provide Chicagoland with aluminum liners for natural gas applications along with stainless steel liners. Aluminum chimney liners should only be used when venting a furnace, water heater, or boiler in a chimney that has not been previously used to burn coal or oil. When older furnaces, water heaters, or boilers are replaced a new liner is often required. The new liner has to be properly sized for the appliance to prevent condensation of gases which would ultimately result in deterioration of the existing flue liner and chimney. For those who have a wood burning fireplace, stainless steel chimney liners are the only option. Stainless steel is capable of withstanding the high temperatures of wood burning fireplaces. A stainless steel chimney liner is specially designed to withstand temperatures up to 2100°F (a temperature which could fracture clay tiles). Early Times offers a stainless steel liner that is impervious to rain and water damage. They’re not porous, so they will not absorb creosote. Our liner also comes with a lifetime warranty against rust and corrosion. 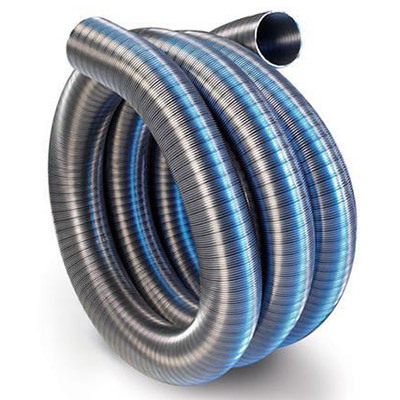 Stainless steel chimney liners can also be used for furnace, water heater, and boiler chimneys. When older furnaces, water heaters, or boilers are replaced a new liner is often required. The new liner has to be properly sized for the appliance to prevent condensation of gases which would ultimately result in deterioration of the existing flue liner and chimney. Having a chimney liner is a smart, safe and responsible move for any homeowner with a fireplace. There are many safety hazards that need to be accounted for when you have a fireplace with a chimney. Overtime, clay tile chimney liners cannot withstand the intensity of the heat, and the tiles may fracture. When this occurs, the flames are able to escape into other parts of your chimney and possibly your home. A correctly sized and intact liner enables the smoke and gases to exit the chimney and prevents the likelihood of a chimney fire. When venting a furnace, water heater or boiler, a proper sized liner ensures that carbon monoxide has a clear passageway out of your home. Carbon monoxide is a deadly byproduct of your appliances and proper venting passage is essential to ensure your home is safe. When you decide to install a new chimney liner, there are a few factors that go into the cost to line a chimney. Aside from location and material cost differences, factors such as size, shape and the condition of your chimney will affect the cost of lining a chimney. If your chimney is in poor condition, there may need to be some repairs done before installing the liner. Also, a stainless steel and aluminum chimney liner will be less expensive to install than a clay liner because there’s less work involved with metal liners. Early Times has been serving the Chicagoland area for over 30 years and we dedicate ourselves to providing your home with the best chimney lining service around. Call us for your free quote and let us get your chimney liner project started.